Pain stemming from the facet joints is known as facet syndrome. When the facet joints become inflamed, they can cause pain, soreness, and stiffness. It can occur at any part of the spine and depending on the location of the pain, facet syndrome symptoms will vary. Each vertebra, there are 33 that make up the vertebral column, has four facet joints. Facets are the smooth, flat surfaces of the vertebrae that interlock and allow the spine to flex. Facet joints permit gliding movements between the vertebrae. These joints are in constant motion, providing the spine with the stability and flexibility needed to walk, run, bend, sit and twist. Two of the joints connect the vertebra above; they are called superior facets. The pair that connects the vertebra below are called inferior facets. Just like other joints within the body, each facet joint is surrounded by connective tissue and produces fluid to lubricate the joint. The surfaces of the joint are coated with cartilage, which helps each joint move smoothly. As we age, the cartilage that lines the facet joint surfaces gradually wears away due to constant, repetitive motions. In many cases, growths called bone spurs can develop. The bone spurs often grow along the edges of the bones and are most commonly found in joints. Friction between the bones can cause tenderness, swelling, stiffness and facet joint pain. When seen in adults over the age of 50, facet syndrome can result in arthritis. 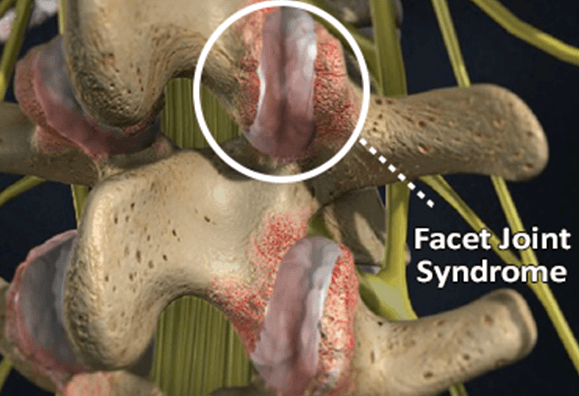 Though generally the result of the natural aging process, facet joint syndrome may also be caused by an injury or overuse of certain joints while on the job or playing sports. While facet syndrome can occur at any level of the spine, it is most common in the lower back or lumbar region. Refers to the condition caused by degeneration and deterioration of the small joints of the spine due to the aging process. Degenerative facet joints mostly happen in the lower back, resulting in radiating pain in that area. Degeneration of facet joints may result in facet disease or facet arthritis. Refers to the condition caused by arthritic changes and inflammation that can develop in spine joints. Arthritis of the facet joints usually results in “referred pain” – i.e. the pain is perceived at a location other than the actual site of the problem. Refers to the condition caused by enlargement of one or more facet joints. One way that the human body responds to the aging process and degeneration of the spine is the enlargement of the facet joints to counteract the lost stability caused by degeneration. This enlargement can put pressure on the nearby nerves and therefore cause radiating pain. Facet hypertrophy mainly occurs in the lumbar region of the spine. Facet syndrome causes are generally the result of the natural aging process. However, the initial cause of facet syndrome may also be an injury, such as whiplash, or overuse of the joints. Another possible cause of facet disease is spondylolisthesis, which is when one vertebra — usually in the lumbar spine — slips forward over the lower vertebrae. When the facet joints become inflamed due to injury or age, the result is stiffness and pain. As the facet joints deteriorate, they may also lose proper alignment, which can cause pain. Additionally, rubbing on the joints wears out the cartilage and fluid that lubricates them. As a result, bone can rub on bone, which results in painful back problems. Facets are compressed when an individual leans backward or to the side, so someone with a facet problem may feel pain in those positions. Leaning forward reduces the stress on the facet joints. Most patients will experience acute episodes of facet joint pain. Because the episodes ca be recurrent and unpredictable, some patients may believe it is all psychosomatic and the pain is being aggravated by stress. When Does Facet Joint Pain Become Chronic? When the facet joint pain lasts for three months or longer, it may be considered chronic and also may be referred to as facet joint syndrome. The facet joint pain may occur on its own or in combination with other conditions that cause low back pain. As with most spinal conditions, diagnosing facet syndrome begins with a thorough clinical evaluation, including a complete medical history, analysis of your symptoms and physical examination. Testing may include x-rays, MRI scan, or CT scan. Pain related to facet syndrome can also be diagnosed through a diagnostic facet injection, a numbing medication, injected into the facet joint. To determine which facet joint(s) is the cause of the pain, medication is injected into the involved facet joints. The alleviation of pain supports the diagnosis that one or more facet joint(s) are the pain generator(s). The type of pain you experience with facet syndrome is similar to many other spinal conditions. Accurately diagnosing the source of the pain is critical in obtaining facet syndrome treatment that will be successful. Steroid injections can help relieve pain for a long period of time as well. The Bonati Spine Institute is the world leader in advanced spine surgery, and is also the first spine institute in the United States to receive FDA approval for the use of the Holmium YAG Laser in spine surgery. More than 55,000 successful procedures have been performed with proprietary procedures and instrumentation. The Bonati Spine Procedures use specially designed probes and the Holmium YAG Laser to remove pain-inducing tissue in nerve branches above and below the affected facet joints on the spine. After a small incision is made, a tiny fiber optic camera is used to visualize and treat the exact facet problem area. As facet joint pain is linked to aging, it may not be entirely preventable. Still, adults can make some lifestyle changes in order to keep their back and spine healthy and prevent facet pain from becoming debilitating.